I'm not a big online shopper. I'm always afraid that what I buy online won't be as nice in real life or else it won't fit me. So after weeks of lusting after the Alexandra Diamante Necklace from The Button and Bow Factory, I decided that for €20 I deserved a treat. I ordered it online while I was in Holland so I'm not sure exactly how fast the delivery was, but it was waiting for me when I got back from holidays 4 days later in really cute girly packaging. I couldn't wait to see it in real life so I ripped open the package but I was slightly disappointed when I saw it first for a minute or two. The gold was more "gold" than the pictures online and the green fabric part is darker than what was shown online. But once I put it on I loved it! All my worries disappeared instantly. It sits perfectly on my collar bone and it's such a gorgeous statement necklace that will receive many compliments, believe me! I have worn it dressed down with a black vest top and jeans, and I have worn it with a green silky top and jeans and I can't decide which is my favourite way to wear it yet. I plan to wear it with something coral over the weekend and I can't wait! The necklace is made from 2 chunky gold necklaces, one bigger than the other and the smaller of the two has diamantes on it. They are woven together with green velvet, which brings gorgeous colour to the necklace. It is a really good quality necklace for €20 and I can't wait to get my next piece from The Button and Bow Factory. You can check out all their accessories here. The Button and Bow Factory are a 100% Irish company with gorgeous pieces that ships around the world, but shipping within Ireland is free. So, what are you waiting for! 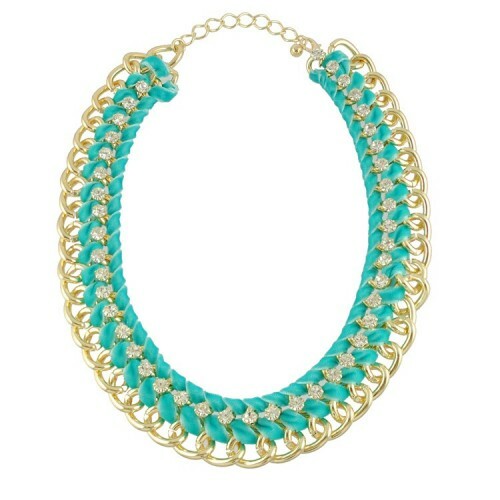 Such a pretty statement necklace! It'll go well with a lot of outfits. :D Love the colour combination too. This was only gorgeous on you the other night Joanne! Thats a really nice necklace! That is such a gorgeous necklace! Love the gold and teal - goes together really well! It's gorgeous! I love the turquoise colour, it's really pretty without being too huge. Thanks - I love it! It comes in black too which I have my eye on. Would be soooo dressy on Id say... Hmmm... Gonna have to make up a wish list soon!